Blog: Fibreflow Cooling Towers (FCT) provides a wide range of cooling towers and manufactures these units right here in Australia. The company is Australian owned. With benefits ranging from the low cost of ownership to long service life, high quality materials and virtually no maintenance, Fibreflow can provide a tailored solution for your application. Fibreflow offers more than 30 years’ experience in the industry, and skills to produce products that stand the test of time – with quality, lifecycle and performance that exceeds their customers’ expectations. FCT utilises the latest in technology and equipment to construct each FRP cooling tower. Every section, piece and fastener is fit to perfection to ensure the coolers are durable throughout the years of use. 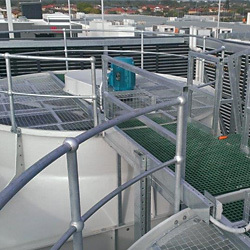 Typical applications include cooling tower structures and components, support assemblies, motor mounts and bearing housing mounts in a variety of materials to suit the clients’ requirements. Fibreflow Cooling Towers uses quality materials in the construction of the company’s FRP cooling towers. It includes such materials as fibreglass pultruded plastic or FRP, 316-grade stainless steel, gel coat, flow coat, resins, copper, galvanised steel and other quality materials in these cooling towers. Once the company combines these materials to create its cooling units, the units outperform a number of the competitor versions. • Forced Draft Cooling Towers are mechanical draft towers that contain a blower fan on the intake. The fan forces the air into and through the tower to create high-entry and low-exit air speeds. • Counterflow Cooling Towers are pressurised towers that allow the air to flow upward to counter the water flowing down from the fill. • Crossflow Cooling Towers are towers with a vertical water flow and a horizontal airflow to accomplish their cooling task. With a variety of sizes to meet your requirements, it is recommended that you select the size that will handle your cooling needs with the greatest efficiency. Coolclean provides sales, installation, repairs, spare parts, basin painting and cleaning for all cooling towers including Fibreflow. We specialise in maintaining this equipment and believe in providing our clients with only top-quality products and services.